So far it looks amazing ! 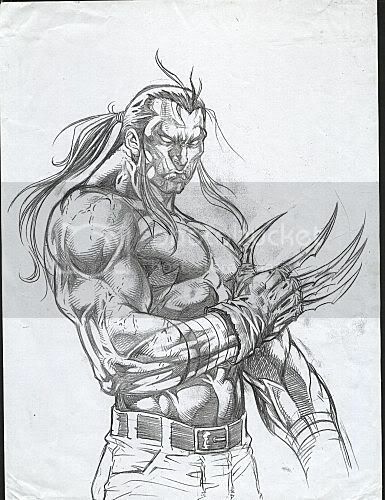 I think your strength lies in your inking , which reminds me of Rudy Nebres. If you get together some penciled pages from other pencillers and ink them , I would put them together as a portfolio and see about submitting them to companies like Dark Horse , Top Cow , etc. I believe you would have a great chance of getting hired based on your inking skills Jim. No I meant he redrew it. The one you originally posted was Kirby pencils. If he redraws it you can't see how his inks would look over Kirby which was what was asked. But whatever. Loaded is that I knew your name. I'd always heard you had some talent." I think you are a magnificent artist much better than me and much better than many artists I've seen here and around the internet and Pro Comics. But here's the thing you are an embellisher on other peoples artwork. Jeffo46 mentioned Rudy Nubres he and Alfredo Alcala and many other Spanish artist from the 70s were embellishers and they were fantastic at it. An embellisher can make a poor artist look great. But In My Opinion inking is almost a lost art in most modern comics, a good inker should be invisible only accentuating the lines of the penciler and adding nothing of his own style. If you are hired as an embellisher go crazy but if you are hired as an inker you should add nothing of your own style to the pencils IMO. 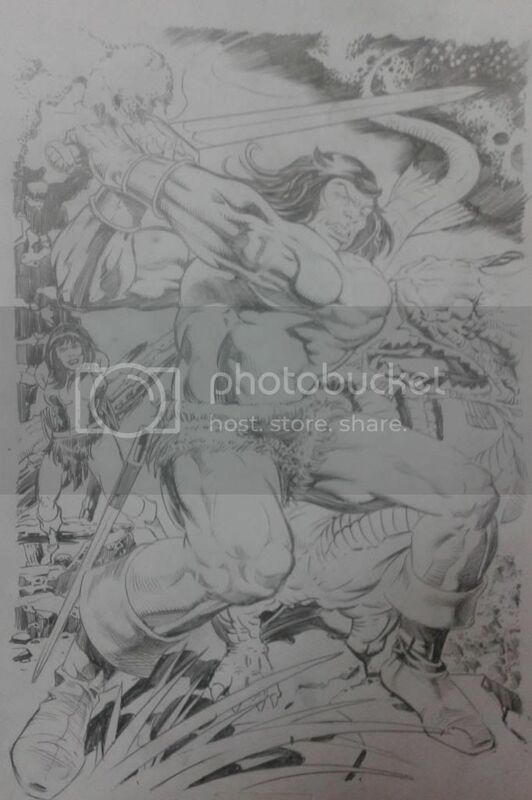 Your second pass at the Kirby Conan inked is great! But you put lines in there that Kirby didn't draw, you "fixed" his anatomy and many people have done that with Kirby but when you do it takes away from what HE did. I know what I'm saying will be lost on many people reading this judging by the inking I see in modern comics, some inkers bury the penciler under their own style and it's sad to see. Here is a John Byrne Rudy Nubres comic from the 70s. Rudy embllished the heck out of Byrne here only the strong composition and design sense of Byrne is left. Edit: I get what Co.Ink is saying. The best inker on kirby was Mike Royer. He held to Kirby's vision the best out of them all. 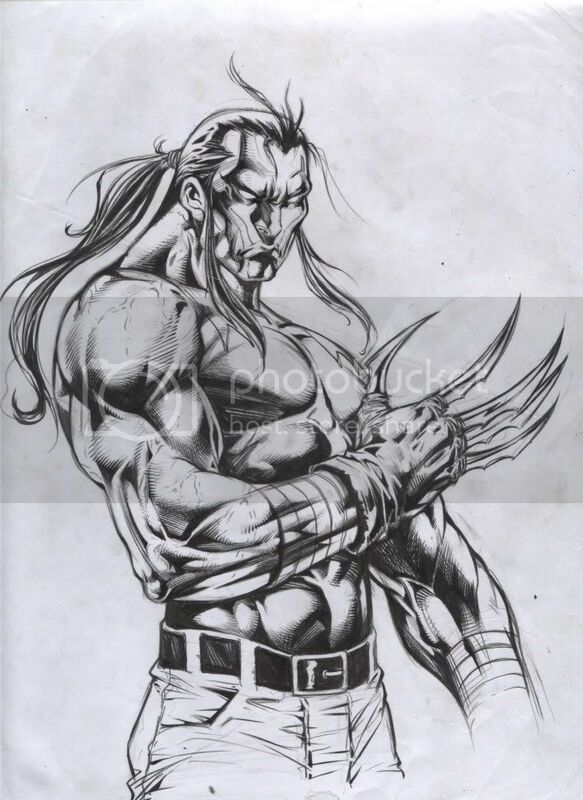 Inkadink , First of all , Rudy Nebres and Alfredo Acala are Fililpino , not Spanish as you clamed . In the 1970's, there was a huge influx of artists which came from the Phillipines starting with the late Tony DeZuniga . I looked at the piece that you posted with Byrne and Nebres and while you could see Byrne's style in it , it was heavily overshadowed by Rudy's inks. I personally think that Jim did a great job on the Kirby piece . True his style is there but looking at it, you can still tell that it's Jack Kirby as well . I still stand by my statement that Jim would be a great inker in this business . I personally think that Jim did a great job on the Kirby piece . True his style is there but looking at it, you can still tell that it's Jack Kirby as well . I still stand by my statement that Jim would be a great inker in this business . I do too if he can reign himself in a little more and be invisible, if not he'll be a great embellisher. No doubt this guy is a fantastic artist no denying that but if you look at the history of Kirby and others like him they didn't want people redrawing their stuff and fixing it. If any artist draws full pencils he intends every line to be inked, if he did breakdowns it's more open to interpretation. I hope this doesn't come off like I'm putting Jimlai down here, I'm amazed at his ability here and it's awesome to behold but he changed alot in that picture. Of course you can tell it's Kirby that's not the point. The point is he softened Kirby's zip lines and added and subtracted all sorts of details in this pic, he made it his own, he embellished it. I'm not saying this is wrong I'm saying if he were hired by a company to ink this picture and handed this in it wouldn't be considered inking it would be considered embellishing. He did a great job and it looks great but when Jack Kirby drew that picture 34 years he put those lines there for a reason. I know some people like to see different styles blended and so do I but the request was just to ink. Look at the original there are thick and thin line weights and cross hatching and all sorts of detail that Kirby put there it's not open for interpretation. I guess we're not going to agree, I'm going to let it go I don't want to highjack Jimlai's art thread here and start trouble the work is fantastic he has great skill and he could be a Pro artist Yesterday. But this is embellishment not inking, inking is dong exactly what the artist laid down on paper if it is full pencils. Jimlai I'm a fan of your work so I hope you don't take any of this the wrong way. No doubt this guy is a fantastic artist no denying that but if you look at the history of Kirby and others like him they didn't want people redrawing their stuff and fixing it. If any artist draws full pencils he intends every line to be inked, if he did breakdowns it's more open to interpretation. Thomas also said that he didn’t think Kirby was interested in teaching other artists because he didn’t want to teach them to be Jack Kirby; he wanted them to find their own way. but when Jack Kirby drew that picture 34 years he put those lines there for a reason. I know some people like to see different styles blended and so do I but the request was just to ink. Look at the original there are thick and thin line weights and cross hatching and all sorts of detail that Kirby put there it's not open for interpretation. I never knew Jack Kirby, personally, nor did I ever meet him in person. However, I would like to add a few words on the subject of Jack Kirby. The very thing that distinguished Jack Kirby's artwork was his interpretation of art. His art was often epic in scale, for the very simple reason that his interpretation was equally epic in scale. The inherent nature of art is that it is subject to not just interpretation, but to countless interpretations. Jack Kirby, God bless his soul, is dead and gone. A great body of his work endures. His legacy in comic book art terms is a thing of legend. He no longer owns his own work. In due time, every last bit of it will fall into the public domain. Long after we are all dead and gone, people will still be studying Jack Kirby's art and style. Jack Kirby can't draw for us, anymore. People like this Jimlai can, however. It seems to me that one of the foremost attributes of a great artist is a willingness to make a given piece of art one's own. To leave one's mark, so to speak. What Jack Kirby liked or may have wanted is all fine and dandy, but what he liked or wanted at any given moment are likely things quite distinct from what would necessarily command his respect. If it is true that Jack Kirby wasn't interested in teaching other artists, because he didn’t want to teach them to be Jack Kirby, but rather, he wanted them to find their own way, then isn't that exactly what Jimlai did, call it whatever else you may? Nicely said Charles. It's no secret that Jack Kirby along with the 1960's Marvel Bullpen, are my main artistic influences as you can see by my artwork. If it wasn't for Jack Kirby, there would be no Comic book industry as we all know it today . Everyone who has worked or aspires to in this industry , has at one point or another, been influenced by Jack's work at one point or another whether they care to admit it or not . Jimlai IMO , has the potential to be a great inker in this business and I'm speaking from experience , having worked for several companies as a inker myself. What he did with the Kirby Conan piece was brilliant as far as I'm concerned . He added his own style to it while at the same time , leaving the Kirby signature on it as well . 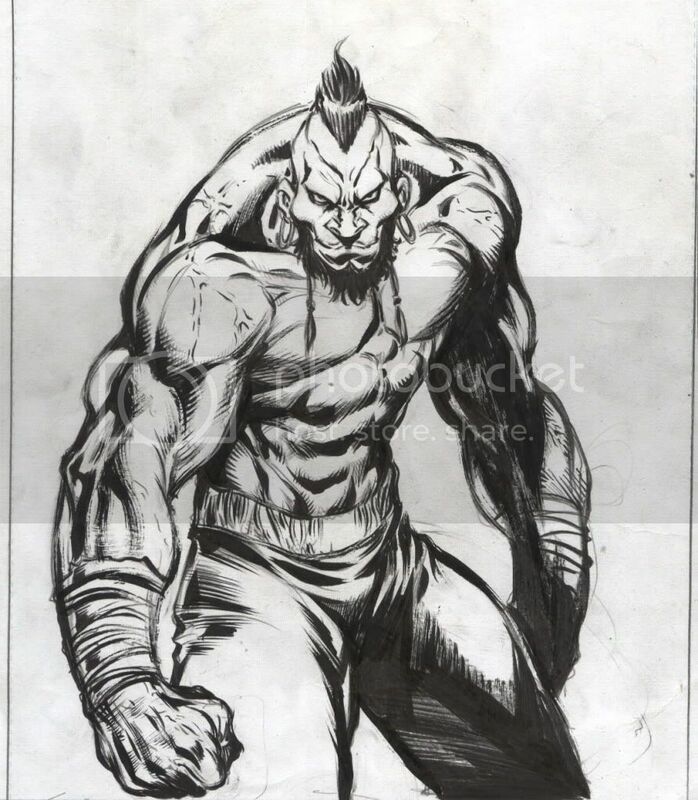 I would love to see Jimlai's inks on other pencillers such as John Buscema , Gene Colan , Sal Buscema , etc. If he's reading this , I hope he is willing to go and look up the artists I mentioned and see what he can do with their work . What about Joe Sinnott , have you ever seen their run on the Fantastic Four ? 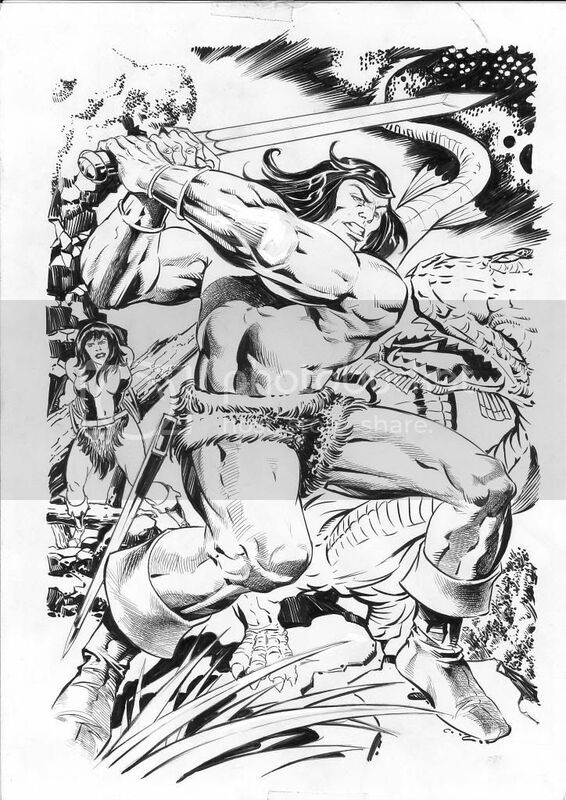 Jimlai , here's a Tarzan drawing by John Buscema I'd like to see you ink, okay ? I didn't want to keep derailing the Thread so I started a discussion of my own.